The M38 book is out in print. It can be purchased at several places. I am offering a one month web member only special which will be $48.00 dollars that includes shipping to the continental U.S. only ( that is the cost to ship inside the US via media mail). This special ends on OCT 1 2009. After OCT 1 2009 the books will be $60.00. Outside the continental U.S. I can check on shipping fees. Currently I am accepting money orders or checks. I am working on possibly setting up a paypal account for those outside the U.S. that have requested it. If you are interested PM me your address/information through this website. Again this price is for web members only and will end OCT 1 2009. Profits from the book go to more M series jeep research. 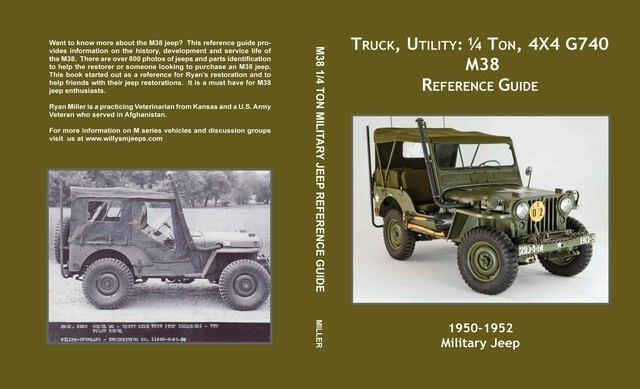 The book is on the M38 only and covers pre-production, production and some of the service life history with lots of factory information and lots of photos with parts identification. THIS IS A ONE MONTH ONLY SPECIAL THAT ENDS ON OCT 1 2009. Below is the front and back cover of the book. Book size is 8.5 X 11 inches, 220 pages and about 850 photos. For those of you that haven't seen this book and missed it at Evansville, it is simply awesome. I have heard nothing but good reviews from a lot of folks. I would like a copy but am currently deployed to Baghdad. Please let me know when you get that PayPal account set up. Thanks! I am working on the paypal thing. Should have it set up by next week. I also checked into overseas shipping to Eruope and it averaged $34.00 more than I thought it wold be. PM me if interested in getting a book - again this is for website members only and will last until the end of September 2009 or when sold out. The book looks like a keeper! Can't wait to get my copy. PM sent!!! Posted: Sat Aug 22, 2009 9:43 pm Post subject: Book,I will take one. Recieved my book Friday. It is one every M 38 owner will want. Great job, Ryan!! Do you suppose someday it will be worth the $200.00 + that the M 37 book by David Ahl is? I did not know that book goes for $200.00!! I only had 200 M38 books printed and I am down to the last 25. Pete Debella and George Baxter (Army Jeep Parts) are selling some books. Depending on how well the book sells I may do another printing of 200, if it doesn't then these will be it. I would like to add some CDN info if people can help by sending some more info/ photos. I did talk to a few people at the show and told them it would be great to do a similiar book on the M38A1, MB and GPW. Will it ever happen, I doubt it, but who knows. I did sign it and sent it out on Friday, should get to you early next week. if this is the book Wes talked about so I NEEEEEEEEED one. sure .. (I hope) how hight the shiping will be? I think it is more than it needs to be, I thought the Atlantic was the "pond". I have set up paypal. send me a pm by clicking on the box at the bottom of my posting and I will send you my information.